do you know of a record shop in irishtown owned by a gentleman named christy riordan?? i am trying to trace any information about an ancestor, David Carroll who was born around 1829 in Clonmell and weet to Bristol, England, where he married Catherine Perkins, also from Clonmel, who was born around 1831. There is a Tithe Applotment record for a J Carroll in 1826 in Irishtown – this may be David’s father? If you are able to offer any information I would be very grateful – happy to visit to see any records. I have not been able to trace any definitive birth or baptism data other that that shown in UK census records. Griffith’s Valuation of 1852 lists a constabulary in Irishtown. It appears to be gone by 1880. Anyone know where it was located? I remember during the 50’s my Dad bringing me into Jim’s pub for a lemonade and a Guinness (for him). It was a very very dark place, something like a tavern out of a Charles Dicken’s novel. I don’t think it had even an electric light! Of course I was very young at the time but I will never forget the experience. Liam, would your great uncle be James Joseph Harding and his father Cornelius Harding? My grandfather was William V Harding brother of James. 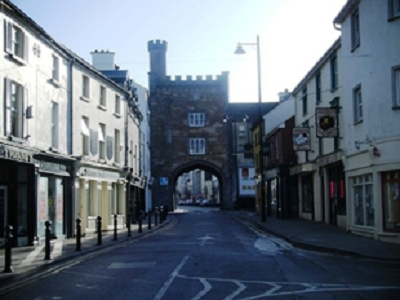 My great grand fathers sister (Marion or Marianne O’Brien) had a Grocery/Drapery shop and Public House at 24 – 26 Irishtown Clonmel up until 1929 when she sold it on. 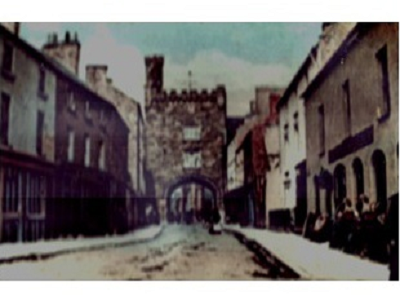 Does the photo here have the area of Irishtown she was based at depicted?